Mother Nature designed horses’ ears to be pretty much self-cleaning. She worked on the principle of preventing a problem, rather than correcting it. “In most situations, the normal amount of hair a horse has in its ears keeps debris out and the ears stay clean,” explained Dr. Nimet Browne of Hagyard Equine Medical Institute, in Lexington, Ky. But if you do clean your horse’s ears, Browne recommends doing it “not more often than once a week. Use a damp [not dripping] towel, paper towel, or wash cloth. You can use witch hazel or warm water, but not alcohol—it can be irritating or drying. If hair falls down into the horse’s ear while he is being clipped, Browne says the horse should be able to get most of it out by shaking his head. You can use a damp towel to gently remove the rest of the hair. For dirt around the outside of the ears or barely inside of them, Browne says that using any product made for dogs or cats, wiped on a cloth, should also be safe for a horse. 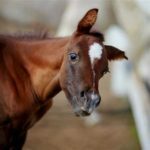 Ear infections can be frequent for dogs, cats, and small children, but, fortunately, they are “pretty uncommon” for horses, Browne said. However, horses can develop growths on their ears: sarcoids (usually benign skin tumors that can be invasive), tumors, and aural plaques that look like black or white cauliflower. These growths can be painful, and they can cause an infection if the horse can’t clear his ears by shaking his head. Physical signs of an infection include a discharge or foul odor coming from the ear. Indications from a horse’s behavior can also include shaking his head excessively, tilting his head, and shying away if he is touched near his ears. An infection in the guttural pouches or inner ear may be indicated by a nasal discharge or swelling in the throatlatch area as well as a head tilt. If any of these signs appear, call your veterinarian, as they can be serious. Bites from flies and other insects also can result in infections. Browne notes that, although it hasn’t been proven, evidence suggests that aural plaques caused by the papilloma virus may be spread from horse to horse by blackflies. To help prevent this, she recommends using fly masks that cover the ears. Another solution: fly spray. To apply it to a horse’s ears, spray it on a towel, then wipe the towel around the base of the ears, the external ear, and barely inside, Browne says. It’s also important to check your horse’s ears regularly for ticks and ear mites, if you are in an area where these are a problem. Ear mites, in particular, can be so small they are hard to see, but typically a horse will be shaking his head to stop the itching they cause. Another sign: crusty scabs that ooze fluid. “Ear mite bites can look very similar to fly bites,” Browne said. Seasonal weather can cause problems for some horses’ ears; white horses with pink skin can get sunburned around their ears, for example, although the upright position of the ears and the hair covering the outside surface usually protects the skin. Browne suggested applying a thin layer of children’s sunscreen on the upper inside of the ears if needed. Deafness in horses is very uncommon, but it can result from some infections or toxicity from medications, and some can have a genetic predisposition for it. “Splash paints—those with a lot of white on their faces and legs and on their bellies—and blue eyes are a color combination that may be deaf,” Browne explained. Some horses are bothered by loud sounds, such as machinery or fireworks during Fourth of July celebrations. Browne suggested using ear plugs on these horses. If the owner knows ahead of time that a horse is very sensitive to loud noise, then it may be appropriate to seek a veterinarian’s advice on strategies for helping. Management techniques can also mitigate the problem. As for noises during shows and competitions, Browne says ear plugs or bonnets to muffle sound are fine for horses to wear—just be sure that ear bonnets or ear plugs are allowed under the competition rules and understand any specifications that might apply. “Keep them clean and dry and remove them when they are not needed,” Browne said.